Dubai’s ever-expanding transport network, including the metro, tram, buses and ferries, recorded a zero crime rate over the last eight years, Dubai Police revealed on Sunday, 25 December 2016. According to a senior Dubai Police official, a special police force dedicated for the security of all transport systems in Dubai, the Transportation Security Administration (TSA), has managed to keep crime out of the city’s sprawling mass transit network, particularly Dubai Metro and Dubai Tram. The TSA was established with the launch of Dubai Metro on 09/09/09 and since then it has been responsible for the security of all transport modes in Dubai. The dedicated force is responsible for the safety and security of all commuters as well as the transport infrastructure, and monitors the daily flow of passengers in and out of trains, trams, buses and stations. Around 16 per cent of Dubai residents use public transport, with daily ridership on Dubai Metro alone exceeding 500,000 commuters. Last year, public transport modes in Dubai witnessed a ridership of more than 500 million commuters. Colonel Mohammad Ahmad Al Bastaki, director of TSA, said that the transport security personnel ensured a zero crime rate per million commuters through meticulous planning and by building a comprehensive data base on security and safety statistics in the global transport sector. Across the world, crime rates are usually higher in crowded areas, particularly in urban transit networks. Col Al Bastaki noted that wherever there are large crowds there are higher chances of security breaches, “so boosting the security net in these areas, including the public transport sector, becomes necessary and this is one of the biggest security challenges in all countries globally”. He added that the TSA developed tailor-made security systems for the transport sector apart from deploying personnel specifically trained for handling the sector. Some of the steps taken to enhance the safety and security of the city include state-of-the-art security inspections systems at metro and tram stations, as well as creating new departments and sections like K9 unit, bomb squads and rapid intervention force. “In spite of various challenges we are facing, the TSA has managed to draw up a successful action plan for its forces as its responsibility is not just to secure Dubai Metro, but also Dubai Tram, public buses, marine transport and Dubai taxis,” said Col Al Bastaki. He said that the TSA regularly participates in international transport conferences to keep abreast with the latest technology and challenges. He pointed out that the TSA, which will be responsible for the security of all major events that will take place in Dubai, including Expo 2020, is ready to face all future challenges. 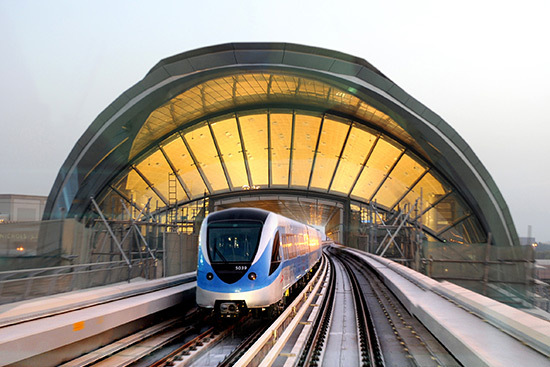 More than 656 million people have used Dubai Metro till date and the number continues to grow. With the metro set to expand further over the next couple of years, the TSA has its work cut out.